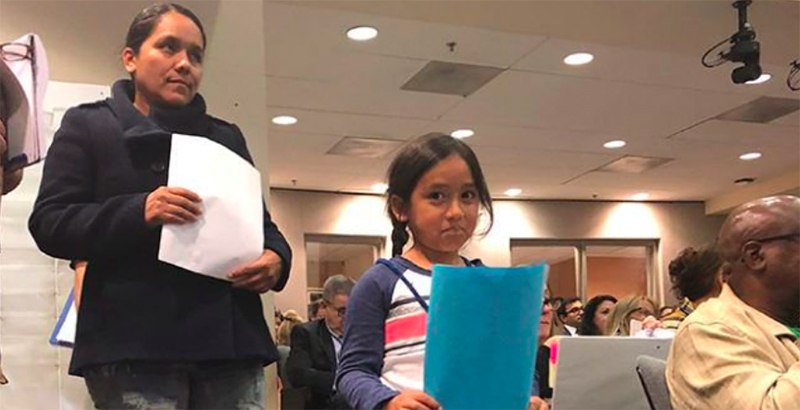 Alisa Ico, a second-grader at Erwin Street Elementary in Valley Glen, and her mother, Susana, came to Tuesday’s school board meeting to speak out about parent volunteers in the schools. This article was produced in partnership with LA School Report. The Los Angeles Unified School District on Tuesday ended the requirement that parents have to pay to volunteer in their children’s schools. The school board voted unanimously to approve a resolution by Superintendent Austin Beutner, who exercised his authority to waive the $56 fee for fingerprinting and background checks. The district will also nearly double — from seven to 13 — the number of locations where volunteers can be fingerprinted. Within 30 days, the superintendent will also present a new policy for volunteers and fingerprinting. Parent frustration boiled over this fall and some school programs were put on hold when the district began enforcing a new policy that resulted in a backlog of volunteer applications. The new policy to strengthen student protection was formalized in August 2017, but this is the first full school year that it was required at every campus. Before this year, only those volunteers who had “significant contact” with students were asked to be fingerprinted, and it was up to the school’s administrator to decide if it was needed. But starting this year, anyone who has any contact with children is required to be fingerprinted. The fingerprinting is part of a federal background check process, and the $56 fee is charged not by the district but by the FBI and the U.S. Department of Justice. Although parents welcomed the safety measures, some reported that the process was complicated and time-consuming. They said traveling to the few processing centers, as well as the cost, created barriers for parents in a district where more than 80 percent of students come from low-income families. About 1,500 to 2,000 volunteers are processed each year, which represents about $100,000 to $300,000 in costs to cover fingerprinting, a district spokesman said Tuesday. “We will be providing a fee waiver for community members, parents and volunteer coaches,” he said by email, noting that the cost will be waived but they still need to be fingerprinted before they can volunteer in the schools. The superintendent’s resolution also calls for the district to value and support volunteer participation. But some parents who spoke at Tuesday’s meeting expressed frustration with the district over how parents are treated. Roberto Fonseca, a member of L.A. Unified’s Parent Advisory Committee whose children graduated from district schools, attended Tuesday’s meeting to ask board members to respect parents. Susana Ico, whose daughter is in second grade at Erwin Street Elementary in Valley Glen, cried as she addressed the board members during public comment because she said she feels the district is not understanding or supporting programs like the one she has volunteered with for the past four years. She said the school’s “mileage program,” which encourages fitness activities among students at Erwin, has been canceled because the program’s vendor is not meeting the district’s policies. Ico said the problem is that the district did not communicate that to them properly. Another parent who had to wait five hours for her turn at public comment welcomed the fingerprinting-fee waiver but asked where the funds would come from to cover it. 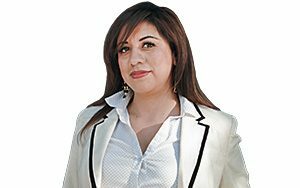 Karla Ysais called on the district to communicate better with parents. “I’ve been here since 12:15 on my birthday because this is important to me,” she said. As he joined parents, students, and education advocates on a panel at the event hosted by Families in Schools, he referenced his intention to waive the fingerprinting fee in an effort to reduce bureaucracy at the district, not only for school leaders and teachers but also, and most importantly, for families, he said. After his panel, Beutner said parents and families have been front and center in the development of his “Reimagining Our Schools” plan, which is in its final stage before being presented to the school board in the coming weeks. Families and communities are “the most important, if not the most powerful, single constituency in public education,” he said. “We should never ask you to come to Beaudry,” he said, referring to the district’s headquarters building in downtown L.A. “Beaudry shouldn’t be the face of public education.” To boost parent involvement, on top of waiving the $56 fingerprinting fee, he said he wants to reduce the number of forms parents need to complete in order to volunteer at schools. In September, Beutner and board president Mónica García sent a letter to the state attorney general and state superintendent asking for help in getting the fingerprinting fee waived.